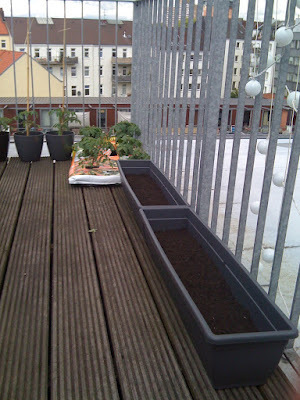 Gardening is a never ending task, even with a little balcony. But a joyous never ending task none the less. The tomatoes have started to accelerate with the slightly warmer weather, and to protect them against the wind I've tied them to the stakes, and tied the stakes to Phil's fancy new windbreak. Every morning new shoots have grown between the main growth stems on the plants so they need to be pinched out. They also soak up quite a bit of water so need a check most mornings. Very therapeutic. As they seemed a little lonely, even in their herd of 18(! 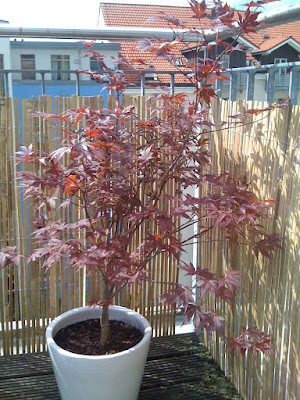 ), Phil decided to accompany them with a very friendly Acer in a lovely new pot, and also take his herbs to the next level with a decent pot and some fresh soil. Hopefully the parsley will come back to life. When I was in the UK last weekend I did the obligatory trip to the garden centre (Geoff will understand), and was browsing through the seed packets thinking about what I could grow should I have an allotment. I came across some quick grow salad leaves, and spied that some lettuce could still be planted, and harvested in August/September. So, the seeds came back to Germany and this morning I bought some nice long pots and some more of the wonderful tomato compost they sell here. The girl in the shop spoke excellent English, even enough to explain to me that using wire to tie up my tomatoes would damage their stems. So, twine it was.